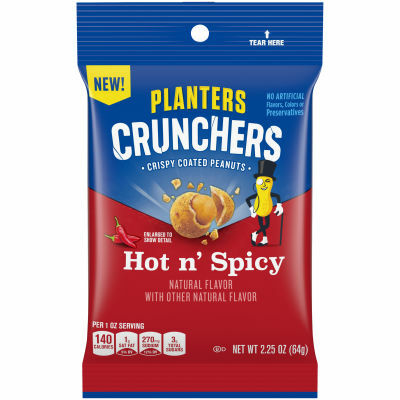 Hot n' Spicy Crispy Coated Peanuts - Planters® Hot n' Spicy Crispy Coated Peanuts are a deliciously healthy snack made with whole premium quality peanuts in a fiery flavored crispy coating. - These peanuts are the perfect protein pick-me-up to pack in lunches, enjoy as a quick snack or dish out for movie or game nights! And because they’re free of artificial flavors, colors, preservatives and contain no trans-fat, these delicious, spicy flavored nuts are the ideal guilt-free pleasure. Serving size 1 oz (28g / about 21 pieces).